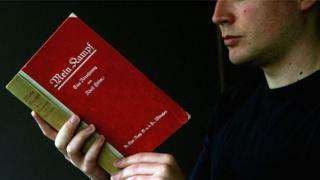 There is no law against publishing Mein Kampf in Germany, but the copyright holders have until now refused permission. Now they are planning to publish a new edition of Hitler's book themselves and Stephan J Kramer, of Germany's Central Council of Jews, agrees the time is right. Contrary to what some people may think, there is, at present, no general prohibition against the publication of Adolf Hitler's book. The reason it has been possible to ban new editions is purely technical. After World War II, the state of Bavaria became the owner of parts of Hitler's property which had been confiscated by the occupying powers - including the copyright to the dictator's publications. Thus Bavaria has been able, so far, to use its discretion and block new editions. However, the copyright expires in 2015. The only imaginable way to continue the existing ban beyond 2015 would be explicit legislation to this effect - a complicated process which might even run into constitutional difficulties and fail to clear the hurdle of the Constitutional Court. What a triumph for the Nazis this would be. And, of course, the power of the existing ban on publication on copyright grounds has already been eroded, to a considerable degree, by new technologies. Those who really want to read Hitler's credo can do so on the internet. Just put Mein Kampf into a search engine and you can receive a pdf file for your computer. This, too, should be taken into consideration. Also, there is no legal ban on the possession or sale of Mein Kampf - for example, in antiquarian bookshops. A ruling of the German Supreme Court more than 30 years ago made this clear. This does not mean that the re-emergence of the Fuhrer's venomous concoction should be taken lightly. Yes, unhindered distribution of Mein Kampf could make the life of right-wing extremists easier, give them yet better access to the book and provide them with fresh ammunition for their propaganda efforts, which find fertile ground in today's difficult economic and cultural situation. Under these circumstances, I agree with the idea of publishing a properly annotated edition of Mein Kampf - with expert analysis and context provided by historians - as proposed by Bavaria. Image caption Hitler wrote Mein Kampf (My Struggle) in 1924, while serving a prison sentence for attempting to stage a coup. After he came to power in 1933, couples were given the book at their wedding as a present from the Nazi state. It has not appeared in German since the end of WWII. Image caption In January, UK publisher Peter McGee said he planned to sell annotated extracts of the book on the streets of Germany, but later backed down. The title of his pamphlet, The Unreadable Book, refers to Hitler's ideology, his "turgid and incoherent" writing style and to the lack of availability in Germany, says McGee. Image caption Professor Horst Poettker, who wrote the commentary for McGee, says: "This material is particularly well-suited for learning what the Nazis thought and how they acted. The book had a wide reach and shows what normal Germans may have known about the intentions of Hitler, Goebbels and the party." Image caption Poettker: "Commentary is necessary because there are statements which may seem convincing. The purpose of the commentary is to separate these plausible points from false, paranoid and inhuman parts and to show how they helped to give the overarching barbaric ideology false credibility." Such an edition would educate the interested reader and, in particular, German youth. It would unmask Hitler for what he was, a fanatic. One who made his views no secret, and yet won massive support from his fellow countrymen, taking Germany into years of dictatorship, leading it to commit the worst crime in human history, to devastate Europe and, ultimately, leaving the country occupied, divided and weakened. Who knows, maybe such educational efforts should have been made earlier? They definitely should be made now. It is important for the annotated edition - or editions - to establish themselves before non-annotated editions, implicitly or explicitly pro-Nazi, become available. Of course, no amount of expert commentary will turn a Nazi into a freedom-loving liberal who embraces the ideal of equality for all. Proper annotation, however, is important to unmask Hitler's propaganda for what it was - an appeal to the lowest instincts of his readers, hate-mongering and intellectual primitivism. This is, just to give one example, true of Mein Kampf's racial theories. According to Hitler's world view, race is the "fundamental element on which all life is based". Therefore, he states, the worth of nations must be based on the different races from which they spring. Hitler went on to demand that "those elements within the folk-community which show the best racial qualities ought to be encouraged more than others and should be especially encouraged to increase and multiply". These statements must be put in their proper historical context. And the annotations must be prepared by experts in the relevant fields, including psychology and educational sciences. I do not think German democracy will be endangered by new publications of Mein Kampf. But handling Hitler's book will be an important litmus test of German political maturity and of whether Holocaust education of the past 60 years has succeeded or failed. My recommendation to go ahead with the publishing project does not mean I feel no apprehension. It does not mean that I belittle, in any way, the monstrousness of Hitler's ideology. And I do understand those, among the general German public as well as inside the Jewish community, who object to any involvement of the German state in printing Mein Kampf. I think, however, that wise involvement is better than running away from the battle. In the face of increasing right-wing nationalism across Europe, we have to be aware that those who fight can lose, but those who do not fight have already lost. The question of whether to republish the book is fraught. Stephan Kramer is not the only German - nor the only Jewish leader - who would like to see a properly annotated version. But some, including academics and historians, believe the effective ban should remain in place. In 2009, German historian Juergen Faulenbach argued against re-release in the Independent : "The book does not provide any important answers to questions about how the Nazi regime was possible. It only contains the polarising views of the author. To lift a 60-year-old ban on Mein Kampf would be problematic." Writing for the Guardian, historian David Cesarani argues that republication would educate the young about the level of responsibility of ordinary Germans for the Holocaust. "Young Germans may start to wonder whether the millions who read Mein Kampf and still voted Nazi or supported Hitler can truly be regarded as 'victims' of all that followed from his rule." In 2011, Waterstones apologised for including Mein Kampf in its Christmas reading list. The festive recommendation was noticed by a customer who told the Jewish Chronicle he demanded an explanation for the bookshop chain's "apparent zeal to promote this disgusting work".